I cannot believe it is already June!! I hope that everyone has been taking advantage of this amazing weather and enjoying everything Alaska has to offer this time of year. I know we all have very busy schedules and try to do as much as possible during the short summer months, but in lieu of a technical lunch meeting for June, we are going to be have an evening social gathering. Next Thursday, June 9, we will be meeting at the Midnight Sun Brewing Company in Anchorage for a tour of the brewery and hopefully a social beverage afterward in the Loft. Meet at the Brewery by 5:55pm and the tour will start promptly at 6pm (http://midnightsunbrewing.com/brewery-tours/). The brewery is located at 8111 Dimond Hook Drive. This is a change from our normal meeting day/time, but we hope that you can make it for a bit of brewing education, some good conversation, and locally crafted food/drink. All purchased food and beverage will be on your own. If you plan to join us, please let me know (aipgalaska@gmail.com). The brewery said there isn’t a limit to how many can go on the tour, but if we can give them an idea of how many to expect, they will be able to better accommodate us. Don’t forget that we have our regularly scheduled section meeting next Tuesday, April 5 at DOWL in Anchorage. This will be a joint meeting with the Alaska Geological Society (AGS) and the Alaska Section of the Association of Environmental and Engineering Geologists (AEG). 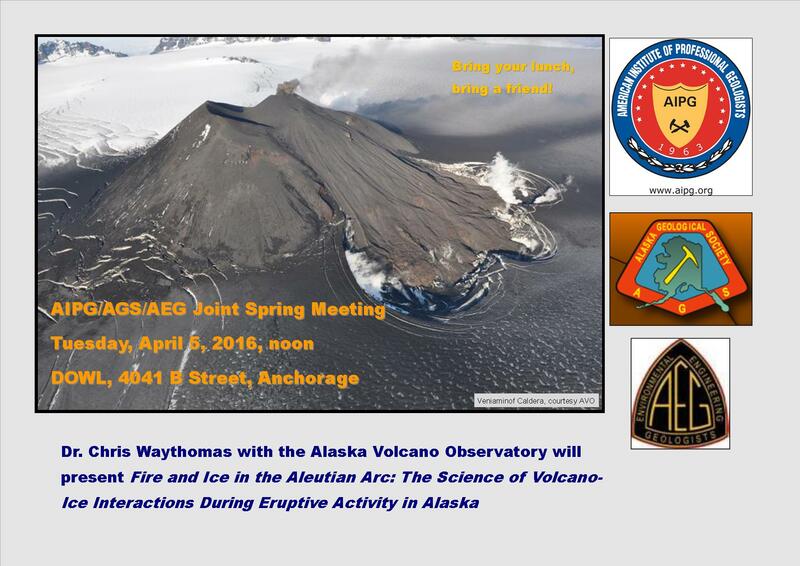 Dr. Chris Waythomas with the Alaska Volcano Observatory will be presenting to us Fire and Ice in the Aleutian Arc: The Science of Volcano-Ice Interactions During Eruptive Activity in Alaska. This is a repeat of the presentation given at the AIPG Annual Meeting in September 2015, but it was a wonderful talk and is now appropriately timed with Pavlof’s eruption! If you plan to attend, please let me know so that I can set the room up to accommodate everyone (aipgalaska@gmail.com). For those in Fairbanks, Shannon and Wilson will be hosting a web-ex; please contact Valerie Webb (VEW@shanwil.com) if you plan to attend in Fairbanks. I hope that you have all had a wonderful and safe 2015 Holiday Season. You have likely received in the mail a postcard with some information regarding our kick start of the Alaska Section for 2016. If not, please take a moment to update your contact information with AIPG Headquarters (aipg.org). The Section officers have been busy working to set goals and start planning events and activities for the section. We would love to hear your ideas and thoughts for meetings, speakers, field trips, scholarships, and more! Feel free to email at aipgalaska@gmail.com or visit our Facebook page at facebook.com/AIPGAlaska. Fairbanks: stay tuned for the meeting location near you! Be on the lookout for our first issue of the Alaska Section Newsletter coming in January – if you have information or news or photos that you would like to contribute, please email our social media officer, David Crotsley, at aipgalaska@gmail.com. We recently received a check from the AIPG Foundation for $4,000 to be used for appropriate geological education programs (K-12, etc.) as we see fit. When this amount is added to the approximately $10,000 we already had in our AIPG Alaska Section account (mostly from members’ dues) we now have about $14,000. How should we spend our money to best benefit the public, the AIPG and the Alaska Section Membership? We are looking for good suggestions, please! We hope for some earth shaking ideas from the seismologists, for an eruption of good options from the vulcanoligists, for some true gems from tjhe mineralogists and for a gold mine of opportunities from the mining geologists, amoung others! After collecting the ideas we plan to poll the membership to find out which ideas have the most support. Some ideas we have had are educational visits to local schools, local and international geological field trips, increased participation in the AIPG National Conference and lobbying of Alaska state government on behalf of the AIPG. We look forward to all your great ideas!